Whilst Byron, Percy and Keats are all currently being used on baby boys, another name of the English Romantic Poets, Bysshe, is not. The middle name of Percy Bysshe Shelley, it would definitely make a perfectly interesting choice for your child. Bysshe (pronounced: BISH) is a rare English masculine name that derives from an English surname. It is considered a variant of the surname ‘Bush’. This name originally meant ‘a person that lived near the bush’. The names origins however are either Norse-Viking, deriving from the pre 9th century ‘buskr’, or the Olde English pre 7th century ‘busc’. 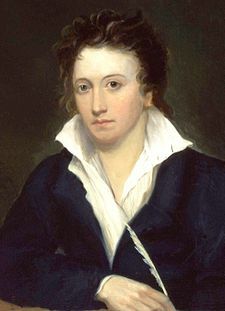 Percy Bysshe Shelley (1792-1822) is the most famous bearer of the name. A Romantic English poet, he is famous for his work, obviously, as well as being the husband of Mary Shelley (author of Frankenstein) and for his death for he drowned in a sudden storm off the coast of Italy, in a boat originally named ‘Don Juan’ but reportedly re-named ‘Ariel’ just before his death. Also, interstingly, he wrote much on vegetarianism. His middle name was to honour his grandfather, Sir Bysshe Shelley. Later on, the Scottish Victorian-Era poet, James Thomson (1834-1882) went by the pseudonym Bysshe Vanolis. There are plenty of variants to the name as well including Bushe, Bish, Bysh, Busk and Buske. All of the variants though were given to less than five, or none at all, in 2011 so this is not a common name. It could make for an interesting name, nick-name or middle name choice for your child and I think there is potential for this name yet. I think, for me, what puts me off Bysshe is the fact that he abandoned his pregnant wife to be with another woman. When Harriet, his wife, drowned herself (she was still pregnant with his child at the time), he married his mistress a few weeks later. Unfortunately I can't disassociate the sad story with his name. You make an interesting case for Bysshe - I know plenty about the poet but have never really looked into his middle name before.